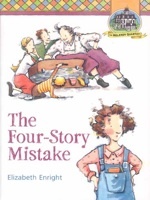 The second in the four-book collection about the Melendy family, Four-Story Mistake follows the four children and their father as they move from New York City to an old house in the country. Without missing a beat, these four very street-savvy children are now quite at home roaming the forest, following the brook where it went, building tree houses and never missing the city life that was so much a part of the first book, The Saturdays. As an adult reviewer of children’s books, I found this jarring; however I don’t believe that children reading the book get as fixated on the past details as much as an adult might. The adventures of the children in the country still carry the same ring of practicality and reality that the first book has. However, that is not necessarily a bad thing. As Nancy Mellon so beautifully put in her book, Storytelling with Children, because of the different temperaments and personalities, some children like highly imaginative books while others gravitate towards down-to-earth practical. Four-Story Mistake is down-to-earth, practical. it is also a little dated. Written in 1942, there is already ample talk of being at war, buying war-bonds, and doing without. This may or may not appeal to today’s young reader, but the characters are interesting enough that the cultural references don’t get in the way. I include this book because it will appeal to some children, although I have to admit that it is not one of my favorites, and pales in comparison to books by Edward Eager and E. Nesbit, who both write flights of fancy and imagination that my own temperament loves. The best I can say is, know your child, and pick the books accordingly.